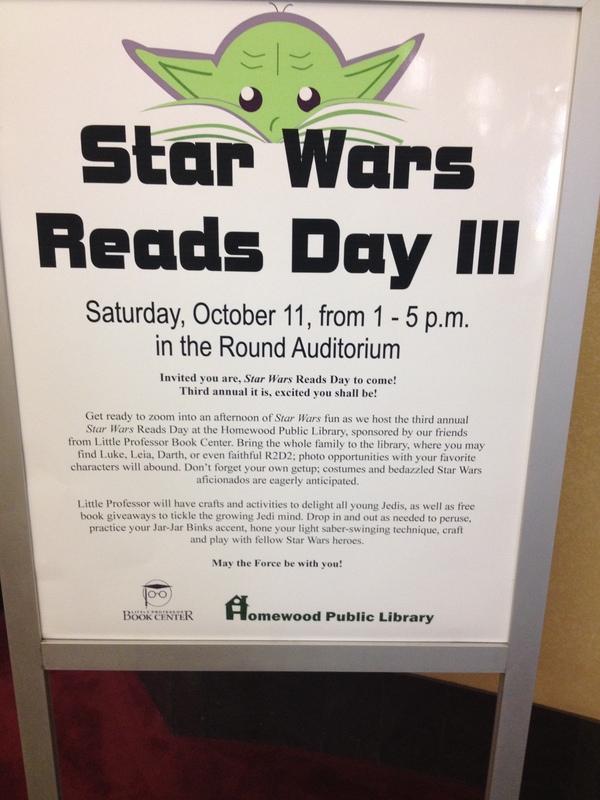 I ran the Star Wars Reads Day event at the Homewood Library today. It’s the second year I’ve run the event and it was pretty great. 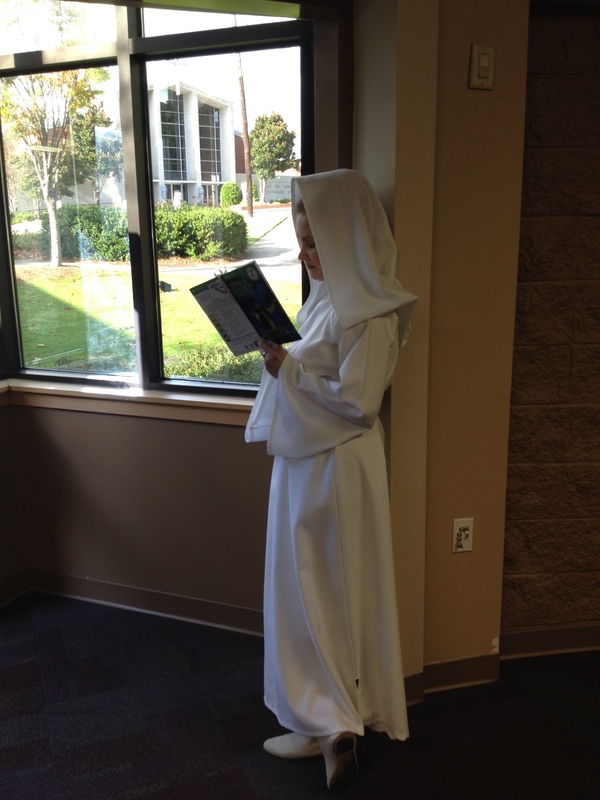 We had a ton of kids as well as five volunteers from the Alabama Garrison of the 501st Legion. If you don’t know who the 501st are please let me enlighten you. 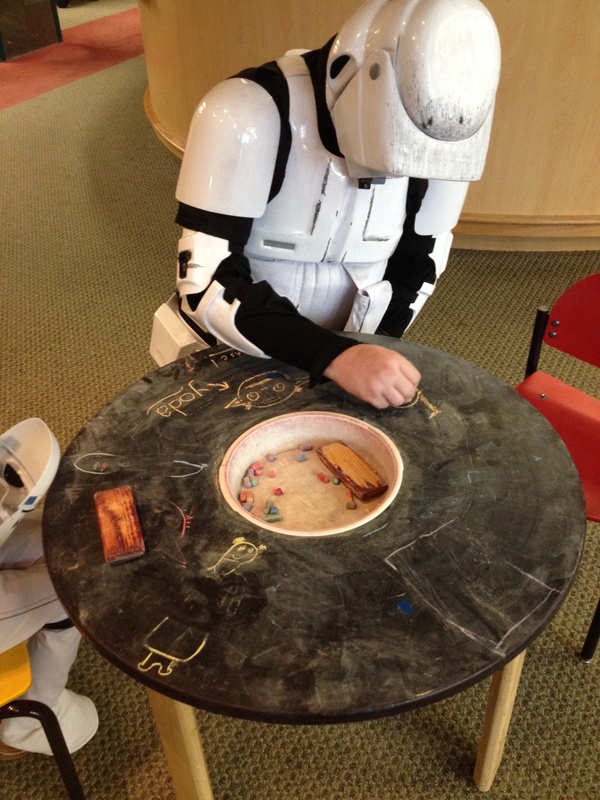 The 501st Legion is a costuming group which makes screen accurate Star Wars costumes and then wears them for charity. They’re about as awesome as awesome can be. The 501st specializes in costumes from the dark side of the force; the sith, the imperial officers, the bounty hunters, the clone troopers, and the stormtroopers. For those on the light side of the force there is the 501st’s sister organization, the Rebel Legion. We started things up at 1:00 and ran until 4:30. 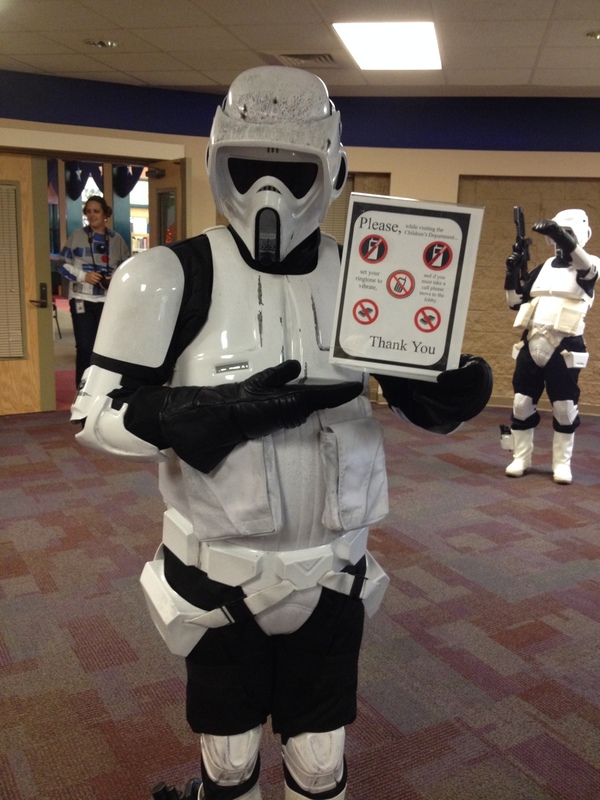 The folks from the 501st were amazing and the librarians were also fantastic. I’m so grateful to them for letting us take over their auditorium with craziness. 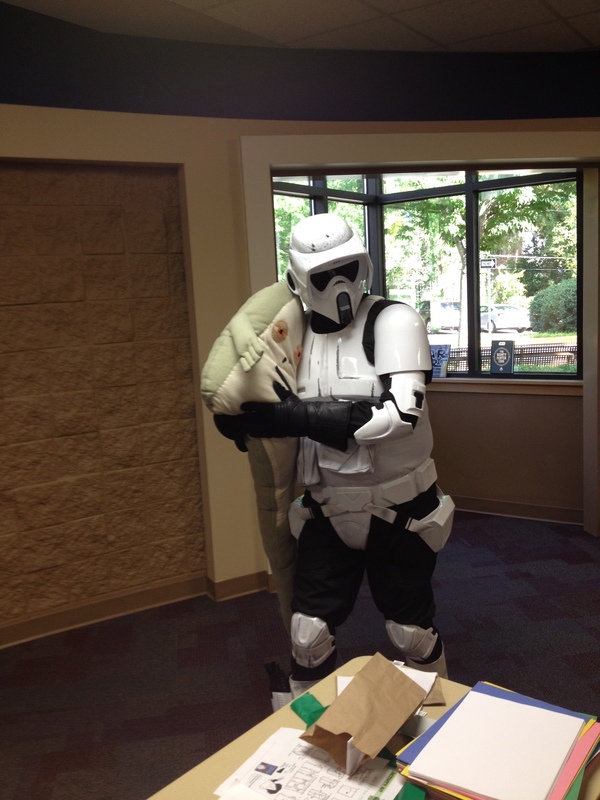 We had a ton of giveaways, including my giant Jabba the Hutt pillow from Bonnie Burton’s Star Wars Craft Book. He was very much in demand. We drew tickets every half hour or so and gave away about 22 prizes. We also had craft activities. We made origami Yodas from Tom Angleberger’s Origami Yoda series. 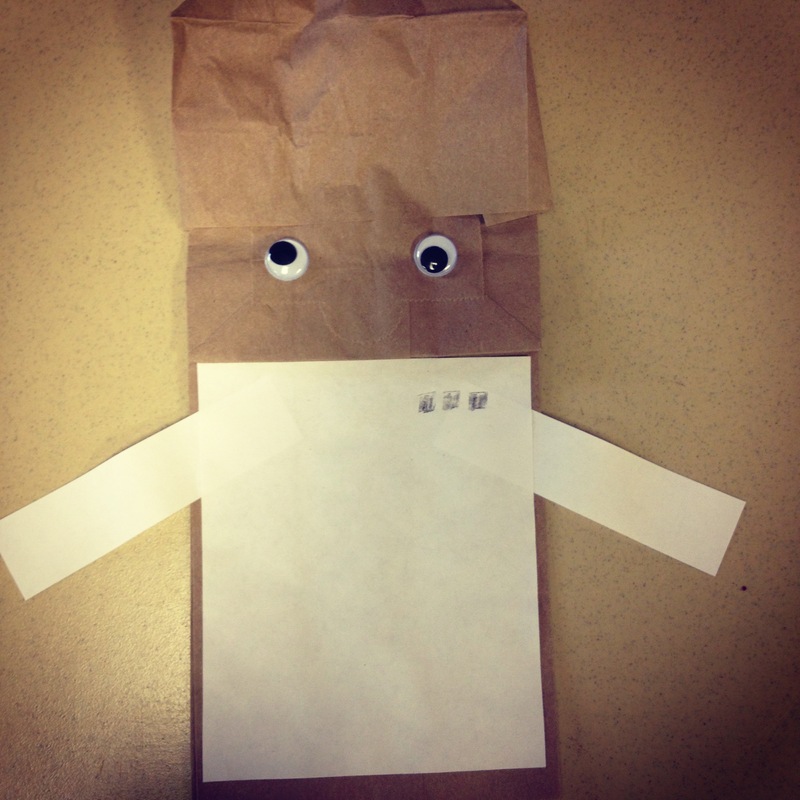 We also made Admiral Sackbar puppets, also from Bonnie’s book. Honestly though, I was not the big draw. It was all about the costumed folks. 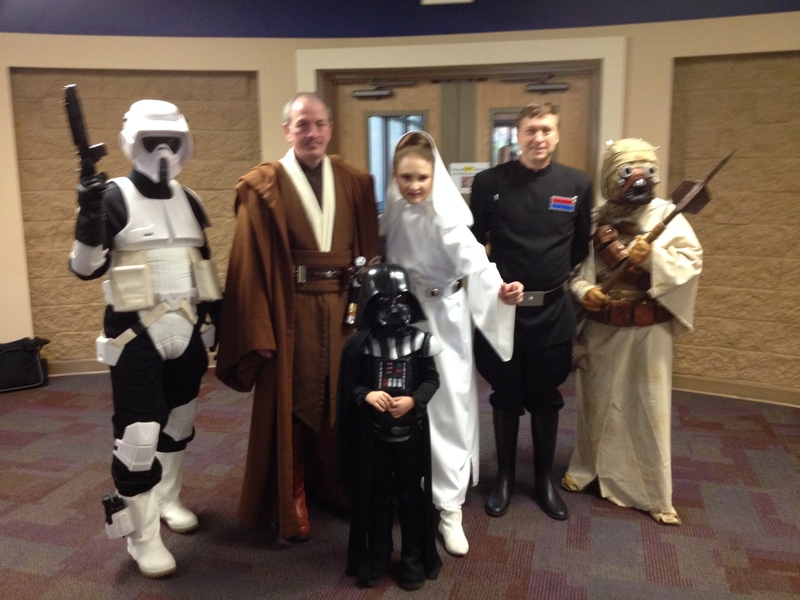 We had two scout troopers, a Tusken raider, an imperial officer, Princess Leia, and Obi Wan Kenobi. They were such troopers. They took pictures with the kids all day. I’m already looking forward to next year! Tiny Darth Vader is adorable! I think that scout trooper is stealing my Jabba!